Flat feet are a common problem and occur when the medial side (inside) of the foot collapses and touches the ground. Ideally in a normal foot the medial side of the foot should be raised from the ground and forming an arch. Some feet look flat when lying down, sitting and standing. Others look fine until you stand and then the foot flattens. Abnormal foot mechanics causes the foot to roll in. 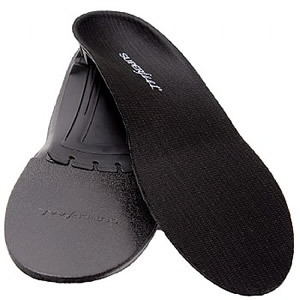 You should wear orthotics or insoles to control your foot mechanics and to support your arch. The more pressure you put on poorly functioning feet the more damage you will do, to not only the feet, but also possibly to your legs, knees, hips or lower back. Examples: A runner with excessive pronation might start to get knee pain about 4 miles into a run, or an older person might have hip pain or bunion pain when walking because of excessive pronation. Flat feet can also be caused by an injury to the tibialis posterior tendon. The tibialis posterior is a muscle which runs down the back of the leg, becomes a tendon and passes behind the medial malleolus (the bony prominence at the inside of the ankle joint) and attaches at various points underneath the foot to support the medial arch. The tibialis posterior tendon is the main support for the medial arch. If this tendon is injured (for example from a direct kick when playing sport) or overloaded (for example overuse in running) it can cause inflammation (tendinitis) or even tearing (partial or complete rupture) of the tendon. Once the tendon is damaged the medial arch loses its support and can flatten. This is known as posterior tibial tendon dysfunction (PTTD) or adult acquired flat foot. There might be tenderness and swelling around the medial side of the ankle and arch. Treatment will depend on the individual patient but early treatment such as using ice around the tender area, elevating and resting the foot, and orthotics or insoles to support the foot, will considerably help. If there has been complete rupture surgery might be indicated. Before any sporting activities are resumed you should purchase some orthotics, or better still get a biomechanical foot assessment from a podiatrist. Try to do a single foot heel raise. If you have posterior tibial tendon dysfunction you will not be able to rise up on to your tiptoes because you can't invert the rearfoot. Excessive body weight. May develop in pregnancy. Excessive exercise - running or other sporting activities can put you at risk because of the constant pounding on your feet. The arch can also flatten with age. Flat feet can cause pain anywhere in the foot, for example heel pain, plantar fasciitis or arch pain, and can produce tired, sore and aching feet. Flat feet can lead to many conditions including bunions, corns, calluses, plantar fasciitis and metatarsalgia. Some people however never feel any discomfort in their feet but instead have ankle, knee, hip, leg or lower back pain. The plantar fascia is a band of fibrous tissue that runs underneath the foot, from the heel to the forefoot. When the arch flattens, this fibrous tissue lengthens causing inflammation and irritation to the plantar fascia - plantar fasciitis. The most common sign that you have plantar fasciitis is that the first step in the morning is very painful. This is because the plantar fascia has been in a shortened constricted position all night and has to stretch when you put your foot onto the ground. See further information on plantar fasciitis. It is normal for very young children to look as though they have flat feet because their feet tend to look plumpish. The arch will start to develop from about the age of 2-3 and by age 6-7 it should be developed. What is not normal? Constantly stumbling or tripping up, excessive intoeing or outoeing feet, knock knees or pain. Wear supportive well fitting shoes. Shoes should have a stiff sole rather than a flexible sole. A shoe with a flexible sole will allow the foot to move too much and this will not stabilise the foot. New shoes are better for you than broken down old shoes. Hold the shoe at the front with one hand and the back with the other hand and try and twist the shoe rather like wringing a wet towel. If the shoe twists easily, it is not supportive enough. A reasonably stiff material in the heel counter area of the shoe will help to improve the stability of the shoe. Wear insoles or orthotics in your shoes to stop excessive pronation, support the arch and allow your feet to function in a better way. You can try over the counter or ready made orthotics first (such as Orthaheel or Superfeet) and then if the pain and discomfort is still a problem then you might need custom made orthotics, orthotics that are specifically made for your feet to an exact prescription. Some shops sell running shoes for normal feet and for pronated feet. If you have flat feet you should opt for a neutral running shoe and then put an orthotic inside the shoe to control the excessive pronation. 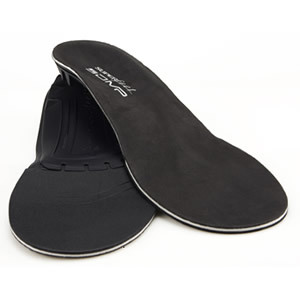 Over the counter insoles: If you have arch pain, fallen arches, flat feet, heel pain, plantar fasciitis, excessive or abnormal pronation, and tired and aching feet Superfeet insoles are a good choice and can help make your feet more comfortable. 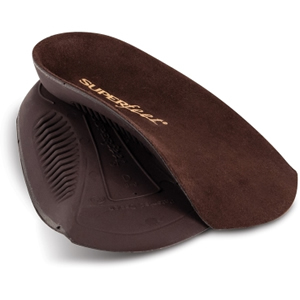 Cutting insoles down to 3/4 size so that they fit into tighter fitting everyday shoes. Use this option for regular shoes.